This guy is about as Kenyan as I am. Sure, looks like a Somali who probably arrived here as a refugee from one of the big UN camps in Kenya. Note that he arrived here as a very young child, but our “welcoming” generosity apparently had no effect on him (remember Ian Tuttle in his NRO article (posted earlier today) pointed out that the ‘next generation’ in America may be worse than their parents in terms of radicalization.) Mosque influence right here in America? Or, just plain old thug genes? Time to send Abdalah Mohamed back to Africa? Abdalah Mohamed also is accused of making disparaging remarks about Jews and Israel in July, according to an arrest warrant affidavit. Mohamed was arraigned Monday afternoon on two counts of second-degree intimidation. He entered not guilty pleas to each count. He was booked into the downtown Portland jail on the warrant Friday. 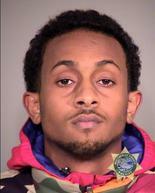 Court records indicate he’s lived in Northeast Portland for about six years and is originally from Kenya. That’s when Mohamed started shouting threats laced with profanity and demeaning comments about Jews and Israel, Freud wrote. Mohamed left the store, continuing to yell at Rafai and spit on the ground toward Rafai, the affidavit said. While police were investigating and interviewing witnesses at the deli, Mohamed is accused of calling the store and leaving another derogatory message, the affidavit said. According to court records, Mohamed came to the United States in 2000. So who is responsible for the refugees in Portland? Go here for a handy list of contractors bringing refugees to your cities. Unbelievable…I will have to post this! Thanks! and there’s this one. You have to investigate beforehand. Those LEFTIES in OREGON deserve these Somalis and whatever God Forsaken origin, the others are from….I HOPE THEY PAVE THEM OVER WITH THEIR CRAP ! I’ve read that Norway has been deporting a record number of illegal criminals. We have to start doing the same. If these “refugees” don’t automatically receive citizenship, then we have to start repatriating them when they become criminals. There are enough Mohamed cigarette stories to fill a book! Earlier this week in Pennsylvania, on the famous smuggling route I-78, police stopped a speeder who was driving erratically. The driver, Ely Mohamed, had more than 8,500 packs of untaxed cigarettes in his vehicle. Police said the 851 cartons had an estimated street value of more than $102,000. Hatim A. Mohamed of Richmond, Virginia, was stopped on a traffic violation in New Jersey while driving a rental car. Police found in his possession many cell phones and 250 cartons of cigarettes. Mohamed was charged with transporting and possession of untaxed cigarettes and was released on his own recognizance, but the police held onto the rental car since the rental agency said it was overdue.